New York, NY – June 26, 2018 – The LIVE premiere of the 2018 "BET AWARDS" on Sunday, June 24, is now the #1 Cable Awards Show among P18-49 for the 2018 broadcast season, and claims the #1 spot for the fourth consecutive calendar year (2015-2018). The 2018 "BET AWARDS"drew 4.3MM Total Viewers P2+ (EDAC), as it was simulcast LIVE across 8 Viacom networks including BET Her, Logo, MTV, MTV2, MTV Classic, TV Land and VH1 with 2.9 MM Total Viewers P2+ tuning in on BET alone. Additionally, the 2018 "BET AWARDS" continued its reign as television’s #1 Cable Awards Show among African Americans 18-49 - retaining the title for 17 consecutive years (‘02-’18 on BET alone). The best-in-class show ranked as the #1 TV Show on its Premiere Night among P18-49, for the 2nd consecutive year as well as the #1 Ad-Supported Cable Show on Premiere Day, 11 Years Straight among P18-49. Filled with buzzworthy moments, the 2018 "BET AWARDS"is #1 Most Social Cable Awards Show year-to-date for the second consecutive year . ** With a total of 2.1 MM Total Interactions across Facebook and Twitter, the 2018 "BET AWARDS", dominated social media as the #1 Most Social Program of the night (Source:Nielsen Social, 6/24/18), beating out the heavily talked about World Cup games. Fans were treated to an immersive experience as the network broadcast live for 6 hours including the BET Pre-Show (6-8 p.m. EST) and BET Post-Show (11 p.m. – 12 a.m. EST); as well as the 2018 "BET AWARDS"premiere (8 p.m. –11 p.m. EST). The 2018 "BET AWARDS"event night reached 14MM Viewers and 6.2MM P18-49 (includes pre/post/main event across all simulcast nets on 6/24/18, L+SD, 1-Min). BET now holds the Top 3 Cable Awards Shows among P18-49 for the broadcast season 2018 Year-To-Dateamong P18-49 (BET Awards, Hip Hop Awards, Soul Train Awards). Recognizing an exceptional lineup of artists, entertainers, cultural provocateurs and inspiring humanitarians in over 19 categories, the 2018 "BET AWARDS" is now the #1 Cable Entertainment Program in prime among Black Viewers 18-49 (CY18 YTD). Hosted by Academy and the Grammy-award winner, Jamie Foxx, the 2018 "BET AWARDS” aired LIVEfrom the Microsoft Theater in Los Angeles. BET Social Media blazed social timelines on multiple platforms with viewers documenting every moment of this celebrity-filled and unforgettable night. The live telecast of 2018 "BET AWARDS" reigns as the #1 Most Social Program of the night, with 2.1MM mentions across Facebook and Twitter and the #1 Most Social Cable Awards Show Year-To-Date for the second consecutive year. BET Digital’s metrics soared across its sites and apps with engaging must-see 2018 "BET AWARDS" content. Video streams were up an impressive +158%vs last year across all Social and Digital platforms and 108 % across BET’s TV-Everywhere and Connected Devices. On BET.com, 2018 “BET Awards” and BET Experience content saw an increase of +29% in page views vs. same weekend last year. The 2018 "BET AWARDS"was hosted by actor and comedian Jamie Foxx, returning to host the award show for the second time. The night kicked off with electrifying performances by J. Cole,Daniel Caesar, Wale, Miguel, Migos,Nicki Minaj, YG, 2 Chainz Big Sean, Janelle Monae,Snoop Dogg, SlyPiper and Tye Tribbett.Jamie Foxx went off-script to pay tribute to fellow artist Childish Gambino, imitating the dance style featured in his iconic hit “This is America,” while also hailing Glover as a songwriter, philanthropist, movie star, and overall badass. Foxx then called uphim on stage for an impromptu performance of the track. Meek Mill delivered a powerful performance of his first new song since being released from prison, “Stay Woke,” addressing the abhorrent inequalities in the criminal justice system and included vivid imagery of police violence and mass incarceration. A star-studded performance was delivered for this year’s Lifetime Achievement Award winner, Anita Baker. Marsha Ambrosius, Ledisi, and Yolanda Adams blew the house down with their riveting renditions of Baker's “Caught Up in the Rapture,” “Sweet Love,” and “You Bring Me Joy,” respectively. For the first time, BET honored sixHumanitarian Heroes, individuals who have done extraordinary things in some of the most disheartening and trying of situations. Presented by John Legend, those honored included James Shaw Jr. (disarmed Waffle House shooter), Naomi Wadler (11 year-old speaker at March For Our Lives), Mamoudou Gassama (Climbed outside of building to save dangling 4 year-old), Justin Blackman (only student to walk out of his High School on National Student Walk-Out Day), Shaun King (journalist who has been instrumental in covering untold stories in the black community), Anthony Borges (Parkland Victim/Hero who threw himself in line of fire - shot five times). Presenters included the entertainment industry’s top black actors, artists, and entrepreneurs including Michael B. Jordan, Kevin Hart, T.I., L.L. Cool J, Bobby Brown, Tyra Banks, Tyler Perry and Questlove. For a list of winners, performances and must-see moments visit www.bet.com/betawards. For the sixth consecutive year, the BET Experience at L.A. LIVE presented by Coca-Cola® June 21 – 24, 2018, attracted thousands of visitors to the downtown Los Angeles area for a 4-day music and entertainment festival. Held at the Los Angeles Convention Center, the annual festival included the return of Genius Talks, Acoustically Speaking, BETX Celebrity Basketball Game, BETX Main Stage, Coca-Cola® Music Studio, BETX House of Fashion & Beauty, BETX Live and the Kicksperience, along with a newly added activation, Celebrity Dodgeball. The BET Experience hosted some of today’s biggest celebrities including Chris Brown, Sza, LL Cool J, Meek Mill, T.I., Ella Mai, Yvonne Orji, Nas, Teyana Taylor, Jussie Smollett, The Game, Safaree, Amara La Negra, Trevor Jackson, Terry Crews, Jemele Hill, Bobby Brown, Rae Sremmurd and many more! The 2018 "BET AWARDS" took place in Los Angeles at the Microsoft Theater, along with the BET Experience at L.A. LIVE presented by Coca-Cola® from June 21-23. The show aired live on Sunday, June 24, 2018 at 8 p.m. EST/PST. An additional encore viewing of the 2018 "BET AWARDS" aired immediately following the Post-show at 12:00am EST. Fans can catch additional airings on Tuesday, June 26 at 6:56 PM ET and Thursday, June 28 at 7:56 PM ET. The 2018 “BET Awards” will premiere around the world on BET’s international networks. It will air in the UK on June 26th at 9:00PM BST, in Africa on June 26th at 8:00PM CAT, in France on June 26th at 9:00PM CEST and in South Korea on June 26th at 9:00PM KST. Internationally, fans in 100 countries can also stream the 2018 “BET Awards” live with BET Play, BET International’s subscription video on demand application. The iOS and Android app, which also features current and classic BET television series, documentaries, stand-up comedy and legendary musical performances, will carry a live feed of the red carpet and the Awards, and is available for download now in the iTunes and Google Play stores for $3.99 a month following a seven-day free trial. Connie Orlando, Executive Vice-President, Head of Programming at BET served as Executive Producer for the 2018 “BET Awards” along with Jesse Collins, CEO of Jesse Collins Entertainment. 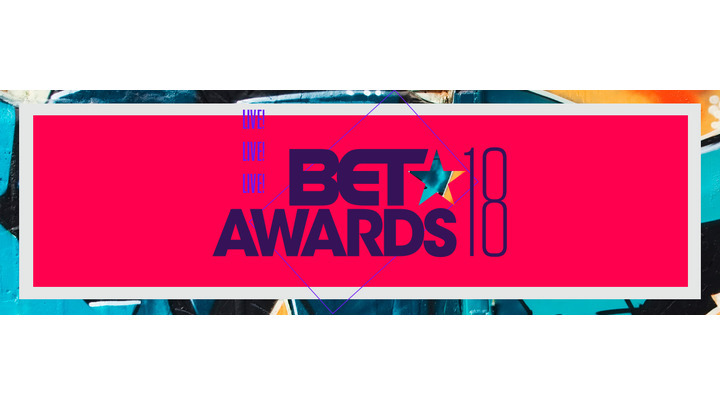 BET.com/Awards is the official site for the 2018 “BET AWARDS” and features all the incredible content from this year’s show. Join the conversation on social media by following #BET Awards on all social platforms. ** Social based on Nielsen Social Content Ratings, linear metrics. *1/1/18-6/24/18 excluding Instagram owned data. Digital based on Adobe Analytics, day of BET Awards and period of BET Experience, Awards/Experience content only across all platforms. Data retrieved 6/25/2018. “Same weekend” last year in reference to full BET Experience time period. BET Networks, an entertainment powerhouse, and AEG, the world’s leading sports and live entertainment company and developer/operator of L.A. LIVE, have teamed up once again to create the BET EXPERIENCE AT L.A. LIVE (BETX), June 21 - 24, 2018 presented by Coca-Cola®. This four-day festival will be filled with music concerts taking place at The Novo by Microsoft and STAPLES Center; the BET Fan Fest at the Los Angeles Convention Center.